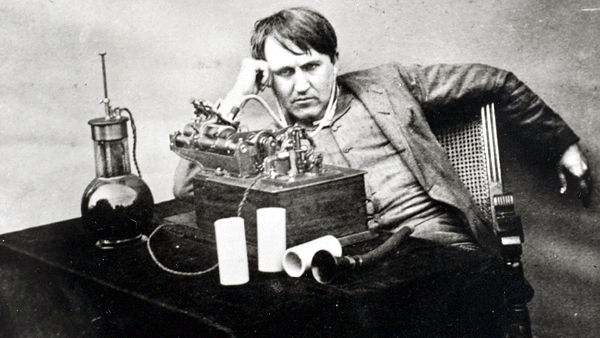 Edison invented the phonograph in 1877. Its sound quality was poor and each recording lasted only one play, (the Gramophone and the Record were actually invented by Berliner in 1887) but it set into motion a change that completely altered the way musicians and listeners interacted with each other. Until then, music was produced only when musicians played and music was heard only when audiences listened to musicians play. But not anymore. People could now listen to music whenever they wished, and musicians had vastly greater opportunities to be heard; even when they weren’t playing. But it also changed the relationship between musician and audience dramatically – almost irretrievably – since the live performance ceased to be the sole, or even primary, medium of interaction between the two. It also introduced a third player into the equation, one that would eventually grow to a gargantuan size, controlling both musicians and audiences; but more importantly, immensely influencing the development of the relationship between player and listener. The ability to record music introduced technology and manufacturing into music, eventually creating three interrelated industries: recording equipment (recording consoles, for instance) manufacture, recording device (records, tapes, CDs) manufacture and recorded-sound reproduction implement (stereos) manufacture. It also gave birth to two discrete services: sound engineering and marketing of recorded devices. Of them all, Marketing became the biggest operation, eventually encompassing most of the others, simply because recording equipment was no use unless someone sold the recorded devices to listeners; and sound reproduction technology was no use unless someone put those recorded resources into the hands of it’s users. The source of the sound was still the most important component of all in the chain, naturally; but the source was not the musician anymore, it was the recorded device – millions of copies of vinyl and plastic sold across the world. The oxymoron known as the ‘Music Industry’ was born. As Music Corporations grew in size and spread, their objectives too were transformed. Selling copies of the music became more important than the music itself; and maximizing profits became the primary objective. A&R Executives were hired not for their ability to spot high quality musicianship but for their ability to find what they could sell most. The latest fad that could right away sell 500,000 records became more important than the musician who could contribute 20 years of pioneering effort. Bands could be manufactured, milked, bilked and discarded at will. None of this is surprising, since it is in the nature of all businesses to pursue profit by selling what the customer will buy, at the highest price the market will bear. What is amazing is how, for so many decades, the vast majority of musicians so willingly acquiesced in this quantitative measurement of talent. The greatest thing to happen in a musician’s career was to get a recording deal from a ‘name’ label. Success was measured by the number of records sold; and jet-setting across continents in the first-class section of the airplane became the pinnacle of musical success. The problem was that Danny got bored playing in only one style, so he’d go from bluegrass, to rock, to blues, to jazz – all in one jaw-dropping solo. Bootlegs of his gigs were circulated among the fraternity like the Holy Grail. But the music industry found it impossible to pigeonhole him into any of their marketing categories. So they couldn’t sell him. Which meant he went under the mainstream media radar, as well. Most of you who read this will not have heard of Danny Gatton – because ’success’ eluded him. (Gatton shot himself in the head in October 1994. The reasons are not known.) I wonder how many great musicians we have missed hearing because they never got a decent record deal. The Internet and digitization have changed this scenario radically. Recording technology is in the hands of the musician now, distribution is in the hands of the listener; and neither is going to let go. This is as it should be: the relationship between the two should be direct, and intermediaries should be facilitators and certainly not barriers or filters. The Industry of course, has found it hardest to accept this since it threatens their existence. They’ve reacted by using copyright laws with a heavy hand, threatening downloaders and sharing sites with legal action; and extracting heavy penalties wherever possible. (The long-term effect of this maladroitness will be to make it more and more apparent that in any conflict of interest between big business and the public, even democratically elected governments will invariably support the corporates, defending the interests of the non-voter over the voter; but that subject calls for an entirely different discussion.) This is futile. On the one hand torrent and blogger sites keep reappearing like mushrooms. On the other, new bands – and many existing ones too – are recording and sharing their music on their own. Elsewhere, Apple, currently the largest distributor of music, sets its own pricing and marketing policies independently of the industry. Well, I have news for you guys who think that way. Things have come full circle and the gig has once again become central to music. We’re not going to rake in millions selling copies – plastic or virtual – of our recorded music. For now, we’re going to earn our living playing live. That CD you laboured over isn’t going to make much money. Its going to do something else: “It will act like your Visiting Card, letting people decide whether its worth their while to come and listen to you play live”, as ace guitarist, good friend and general wise man Mark Haydon says. And this is a good thing, after all. Its nice to know you’re in the background while people go about their lives driving, tying shoelaces, eating lunch or waiting for the rain to stop, but the only time we’re truly fulfilled as artists is when we have a live audience that is doing little else but listen to us play. We’re not going to live easy, tying ourselves to the coattails of large commercial interests any more. That happened only to a very few; and it involved a process that denied opportunities to many other musicians who could have made our lives a lot richer if only we’d had access to their music. (The most we can hope for, if we still desire “success” today, is to become ‘mediacrities’ who host or judge music shows on TV.) But the good part is that you don’t have to wait for your pittance from the man in the suit; you are in charge of your own music. that makes the word ‘free’ irrelevant. But I hope we never again allow our value as creative sources to be measured by the number of copies we sell or the amount of money we make. Also, it’d be great if playing live continues to be paramount – anything less would be a considerable loss to our audiences and to us. But you can be sure of this: Everything that you do will require you to play your instrument. What more could you ask for?